Two new books have landed on my desk and they are on the same fascinating subject -- how school desegregation played out in different places. Shade in the Sunshine State, Reflections on Segregation in Florida is by Elizabeth Huntoon Coursen. Trails and Trailblazers, Public Education and School Desegregation in Lunenburg County, Virginia 1870 - 1970 is by Shirley Robertson Lee, who graduated in that county's first integrated high school class. Each one has a wealth historical background and extensive quotes from oral histories of people who participated in school desegregation. We all remember Brown v. Board of Education and tend to think of that -- 1954 -- as the end of segregated schools in our country. The truth is, of course, infinitely more complicated. The transition from segregated to integrated schools played out differently in every state and, to some extent, differently in every county. We remember dramatic stories like the painful integration in Little Rock -- white mobs jeering as nine black students were escorted into Central High School by the National Guard. What we may be less aware of is that in the years after the Supreme Court decision the transition from two school systems to one happened in counties everywhere. Many people still alive participated in that transition. Authors Coursen and Lee have performed a valuable service by capturing some of their voices. "I did not want to go to Central High School (in Lunenburg County, Virginia)," says Violet Johnson Harris. "But my father told me I had to go to get a better education and, of course, I did as I was told. It was my last year in school and I wanted to make it my best." She remembers isolation and discomfort. "There were times when doors were closed in my face as I was about the enter the classroom. I don't know if it was accidentally or intentional. Some things that I experienced in school are difficult to forget. I had never been award of racism until I came to Central High School because people in my community knew and respected each other." Another student, Frances Price Wilson, said that "fear of the unknown" caused her great anxiety as she prepared to transition from an all-black to an integrated high school. "My parents assured me that all would go well and that I should remember to always be respectful to the other students, and especially the adults in my new school, whether black or white....Ironically, it was the other adults -- outside of the school -- that seemed to have the biggest problem with integration; not the students." Writing about integration in Gainesville, Florida, Coursen notes that teachers were surprised -- "the black teachers because the white school had so much, and the white teachers because the black teachers made do with so little." Marie D. Adams, in her role as a new black teacher at Gainesville High, remembers how easy it was to receive what she ordered for her classroom. ; there was "plenty of everything there." Joel Buchanan moved from Lincoln High School (a Rosenwald school) to integrated Gainesville High School in 1963. He noted "the hush" that descended on the cafeteria the first time he and two girls came in to get their lunch. As they approached a table where there were three empty places the folks sitting there "just got up, left their food and moved back...for the first few days we ate lunch at the faculty's table...." But he also records notes he got from fellow students. "I'm glad you're here," said one. "I want to be your friend, but I can't because of my friends." "Another said, "I am praying for you." He remembers a day when "it got nasty" in one of his classes and his teacher, Mrs Philpott, "got her Bible out and read the Bible to the students. She had a few tears in her eyes about the way things were, and reprimanded a student for his very vulgar words with me. After that things became much better." Both books mention the importance of Rosenwald schools. 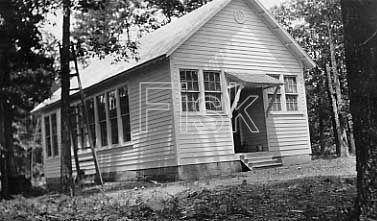 Gainesville is in Alachua County, Florida where there were ten Rosenwald schools. Lunenburg County, Virginia had 4. In 1923 Lucy Morrison, Supervisor of Colored Schools for Lunenburg County, wrote of the West End Rosenwald school, above, "This is a splendid building! I wish every person in the county could see it. The School Board contributed a desk and heater." The Rosenwald Fund had given $500 towards construction of the school; black county residents gave the land, the labor and $1,000 cash. Both these books are full of painstakingly collected documentation and vivid personal voices. They are self-published. There is little glory in doing this work but it is so, so valuable. I, for one, am grateful! Liz Coursen will be speaking about her work in Gainesville later this month -- on February 16 at 3:15 at the Cone Park Branch Library and at 10:30 am on February 17 in the Teen Space room at the Alachua County Library Headquarters. Wish I could be there to hear her!